Dr. Robert Stewart is the director of the E.W. Scripps School of Journalism. 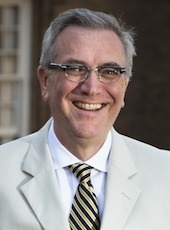 He joined the faculty in 1987. His primary research and teaching areas are media reform, broadcast journalism, online/multimedia journalism, international communication and mass media history. He received his doctorate and master’s degrees in communication from the University of Washington in Seattle, and his bachelor’s degree in communication from Hunter College (CUNY). Prior to joining the faculty at Ohio University, he worked as a broadcast writing and production instructor at the University of Washington and as a broadcast news writer at KOMO Radio/Television in Seattle. He taught journalism courses at Leipzig University in 1993 and continues to coordinate the Ohio University and Leipzig University collaboration. He is co-author (with Don Flounoy) of CNN: Making News in the Global Market. He has published articles in Journalism and Mass Communication Quarterly, American Journalism, Gazette, Privatization Review, Journal of Media Economics and Advances in Telematics.